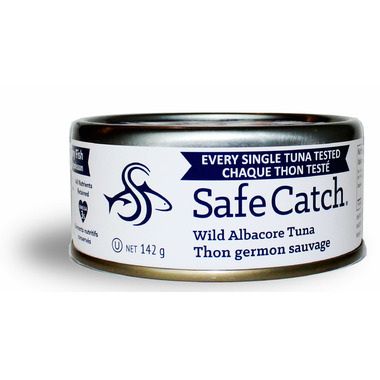 Safe Catch Albacore Tuna has the lowest mercury limit of any Albacore brand. Each hand picked premium wild Albacore tuna is tested. Then later hand packed and slow cooked to perfection to retain all the Omega 3 oils and flavours. No added oil, water, fillers preservatives or broth. Just pure wild tuna! Just empty the can into a bowl and mix together so the tuna reabsorbs any natural oils that has settled. Do not drain. Ingredients: Albacore Tuna (Thunnus Alalunga) and salt. Excellent - much better than others I've tried.